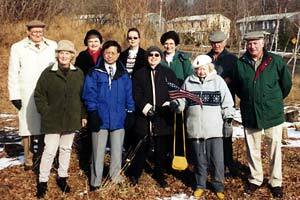 December 11, 2000, was a banner day for the Goddard Association. 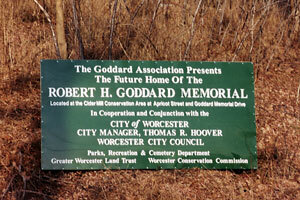 Members of the Association, officials and friends gathered at the corner of Goddard Memorial Drive and Apricot Street in Worcester to formally dedicate the site of the Goddard Memorial. Congressman James P. McGovern headed the group that included Councilors Tim Murray and Konstantina Lukes, Parks Commissioner Michael V. O'Brien, City Manager Thomas Hoover, as well as representatives from Clark University and WPI. Kitty McNamee, Goddard Memorial Association president, addressed the gathering and recalled that she had first lobbied for a Worcester memorial to Goddard 20 years ago because he was a true hero who deserved recognition in the community where he was born and educated. This memorial will be dedicated to honoring Goddard and to educating the public about the accomplishments of "this high man." 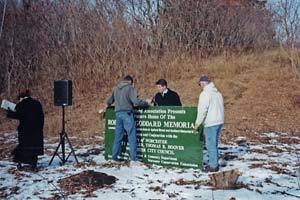 Once the funding is in place, the Goddard Memorial Association will proceed with the construction and hopes to complete the project in the spring of 2002.